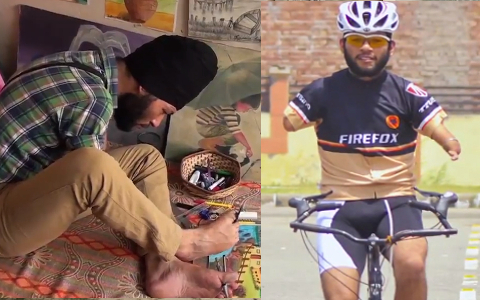 A Gursikh cyclist born without full arms or hands has set his sights on Paralympic glory. Jagwinder Singh, 24, is a competitive cyclist – and an art teacher. The cycling enthusiast was inspired to buy his own bike after watching the 2012 Olympics on television and started peddling in his native town of Patran in Punjab. And much to his family’s surprise, he started cycling to nearby Patiala – a distance of 25 km – three times a week. Previous post 4 Benefits Of Doing Cold Water Ishnaan In The Morning ;Why You Need To Take Cold Showers ?